Chuck Norris is in the news again. He’s become the hero of the American forces in Iraq, as well as a few of the Iraqi forces. They are watcing his movies. To quote: “I’ve seen his videos, he’s a hero. He saves the city, he protects women and children and he fights crime wherever it is. We should all be like Chuck Norris,” Damn straight. Read it here. ~ by lance1977 on March 10, 2008. I have noticed him back in the news again, supporting Huckabee or McCain, can’t remember who. He is an interesting character and has a pretty interesting life story. Got to admire the guy for his ability to come out on top in spite of some pretty bad life experience. 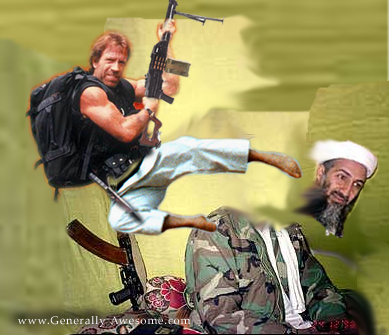 Chuck Norris knows violence is not the right answer. He gets it wrong on purpose.